2014_Pulitzer_Becherer_001SSM: Global News Events: Global News Portfolio: New Orleans based Photojournalist covering the Deep South and beyond. 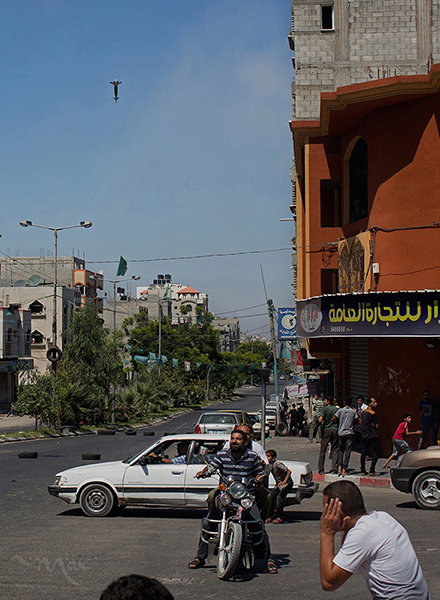 GAZA CITY, GAZA STRIP. Residents react to the screeching sound of what is believed to be a 2,000 pound GBU-10 Paveway II laser-guided bomb captured moments before it hits an apartment building on al-Jalla St. in Gaza City in the Gaza Strip on July 31, 2014. The family that owned the destroyed building had been phoned by the Israel Defense Forces and told to evacuate the house because it was going to be attacked. After the building was evacuated the neighborhood watched as the building was struck with three bombs, which destroyed the targeted building but left the surrounding structures standing.